Audi knows how to make an impressive machine. Their luxury cars are one thing, but what about their supercar? The Audi R8 is practically a perfect car. It gives you supercar power, Audi styling, and the luxury that you would expect from a German-engineered vehicle. They are also expensive to buy them new, but you don’t have to buy them new to enjoy them. Why not consider buying used? 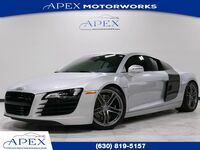 At Apex Motorworks, we can get you behind the wheel of a used Audi R8 in Chicago, IL right away. Not only do we almost always have an R8 option available for you in our inventory but if we don’t have what you are looking for, you can order a used one through us. See our inventory here or keep reading to learn more about us and your R8 options. The Audi R8 was first introduced in 2006, and it is still going strong today. There have been both V8 and V10 models available and the R8 has been built as both a coupe and a convertible. This isn’t just another coupe in the Audi lineup. This is a true supercar with the engine in the back behind the driver. This is the Audi halo car and there’s nothing out on the road today that looks quite like it. Get yours today at Apex Motorworks. Why buy from Apex Motorworks? Apex Motorworks can serve all of Chicago from our location in Burr Ridge, and we even help out-of-state customers get the vehicle of their dreams. Through us you can buy extended warranties, and we even provide free oil changes for a year. As we mentioned above, not only do we often have an R8 option in stock, but if we don’t have the right R8 model for you, we can find the perfect R8 and get it for you. Because we have a large network of dealers that we work with, we can rapidly find any vehicle that you might want which actually lets you order a used car from Apex Motorworks much like you’d order a new car somewhere else. Only with us, you’ll save a lot of money. Click the link below to request more information.